The new Adaptable Geriatric Hand by RCAI is indicated following stroke, arthritis, trauma, or hand injury, and for the treatment of finger, wrist and thumb contractures. Made of a durable, foam covered aluminum; the Adaptable Geriatric Hand can be bent without heat or tools, offering progressive extension of the wrist and finger positioning. The Adaptable Geriatric Hand features adjustable palmar web space abduction with the use of a foam roll for the severely adducted thumb. 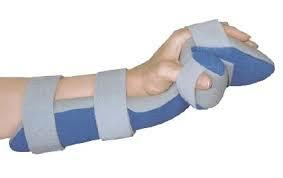 Finger separators, sewn to the liner, provide finger abduction and discourage radial and ulnar deviation of the hand. The breathable, washable liner is made of a wicking material that keeps moisture away from the skin, maintaining good skin integrity.